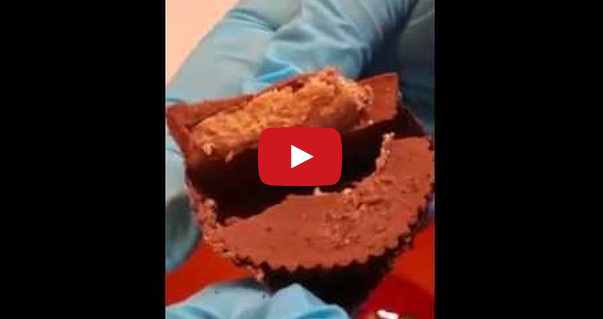 Girl Finds Maggots Infesting Her Reese's Peanut Butter Cup! Are you a Reese’s Peanut Butter Cup Lover? This video will have you changing your mind about that! 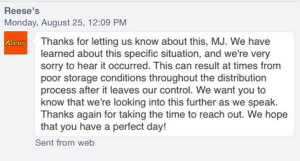 Renae Hubbard uploaded this video to Facebook after making a horrific discovery with her friend while trying to enjoy this package of chocolate and it has received over 260,000 shares. After seeing one small larvae she began to break the candy apart, only to find more and more maggots. She notified Reese’s and, according to Hubbard’s Facebook comments, they offered her $25 and a gift certificate. As the company says in their advertising “THERE’S NO WRONG WAY TO EAT A REESE’S”. We strongly disagree with that! This is not the first time chocolate companies have been found to have maggots infesting their chocolates. Hershey’s Kisses and Cadbury have had several complaints about this very same issue. Be careful when eating! You should always break the candy in pieces before eating it or avoid it all together! 17 Booty Implants That Should Have NEVER Happened!